Reverse engineering took over as I contemplated my one word for 2017. Regardless of context, apathy is an unattractive option. I used Thesaurus.com to consider choices from a list of antonyms for apathy. Interest, concern, passion, sensitivity; care wraps essential pieces of these words into a multi-faceted, easily understood term. For further validation, I went to Dictionary.com to see if care is indeed expressing the tone I'm expecting and requesting, for myself and others in 2017. "care". Dictionary.com Unabridged. Random House, Inc. 2 Jan. 2017. http://www.dictionary.com/browse/care>. Care is worth a minimum of six points in Scrabble, and seven points in Words With Friends. Care is worth a whole lot more to the people who consistently give and receive care. Couldn't the world use more care? 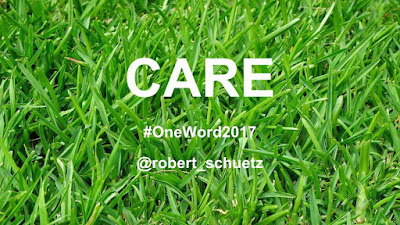 Caring for my family, wishing the best for our students, and having concerns about environmental issues are just the beginning of how care will be a focus for me in 2017. 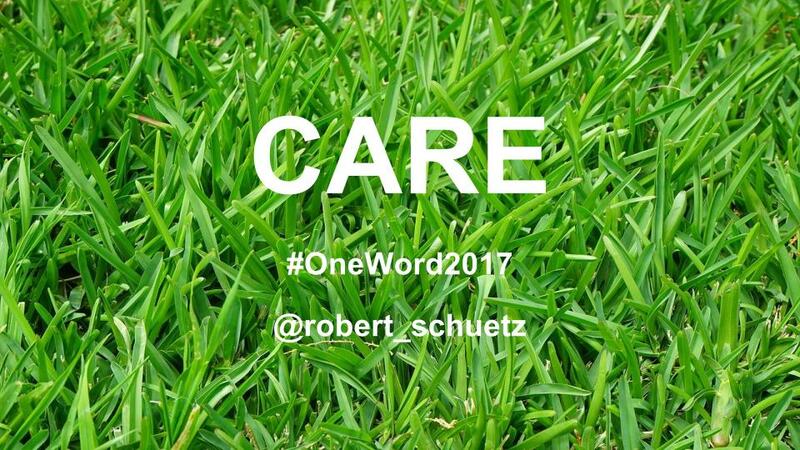 What is your #OneWord for 2017? Thank you for reading and sharing. Wishing you good health and happiness for the coming year, and beyond. Take Care.